Can I sell from the same limited edition run outside of creativehub? If you are selling the edition elsewhere, and want to ensure you don’t sell duplicate numbers, you have the ability to update sales numbers in creativehub to ensure you won't sell duplicate editions. To do this, simply update the number sold in the box shown below to reflect your true sales total. To do this, click the small wheel icon next to the right of the edition numbers. You will see this screen, which enables you to fill in the correct information. 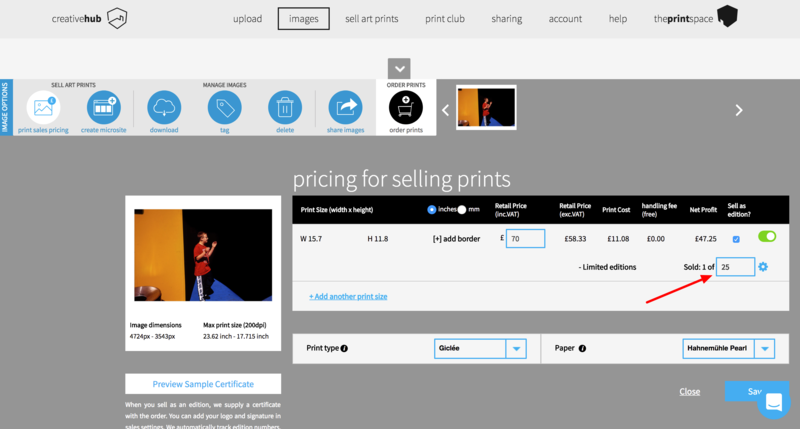 You are also able to download and manually sign your certificate of authenticity to send your customers who have purchased your limited edition prints elsewhere.